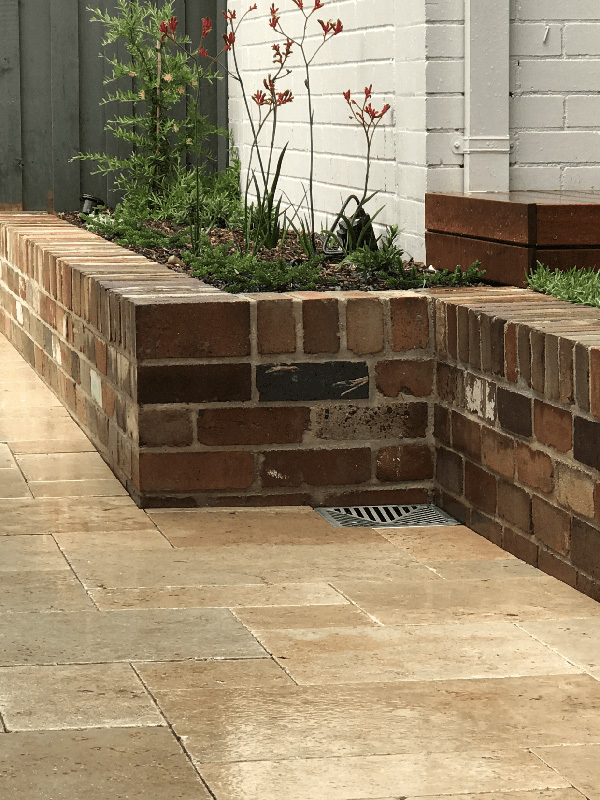 Project Overview – The client required a functional solution to create multiple entertaining areas and also solve a long standing drainage problem. 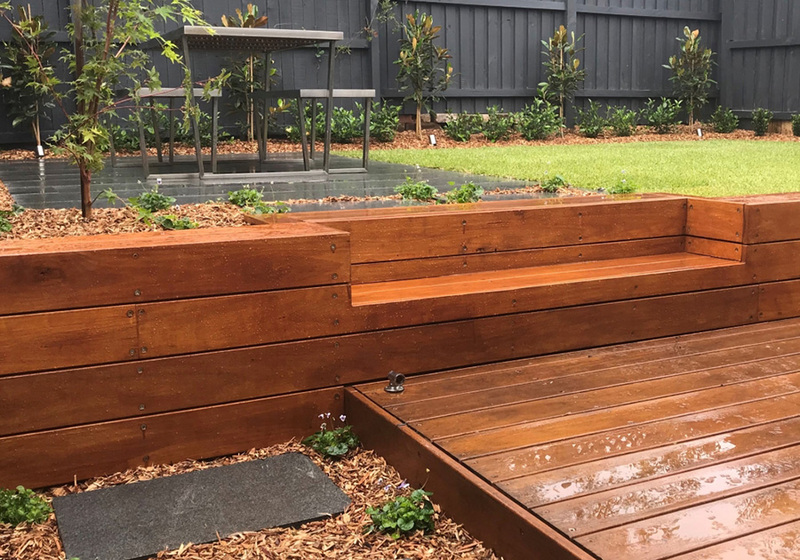 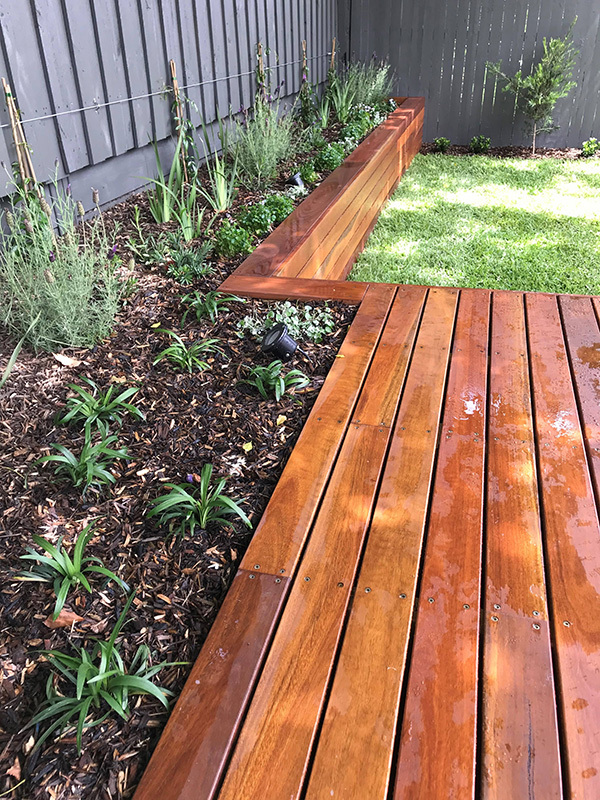 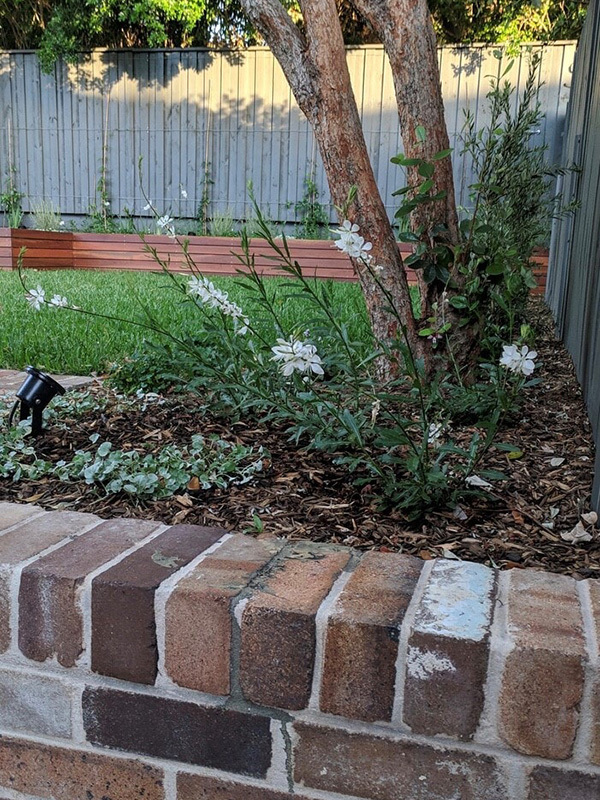 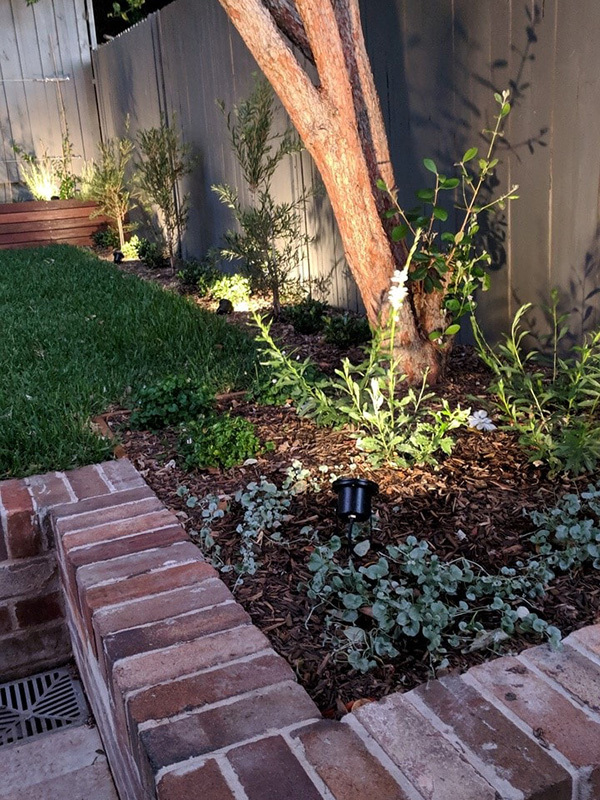 We decided to split the garden into 3 levels using recycled brick retaining walls and timber walls and bench seats the results were impressive. 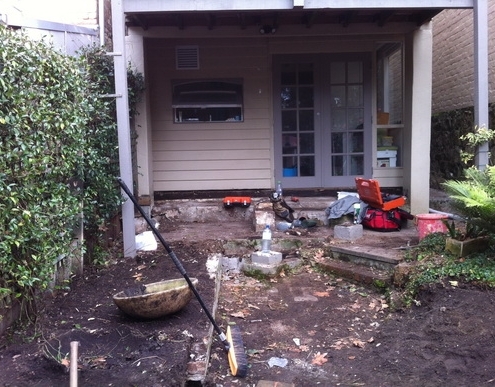 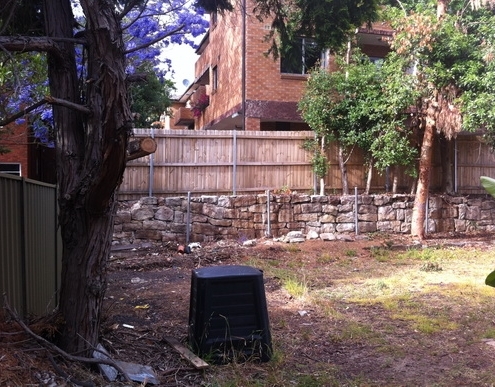 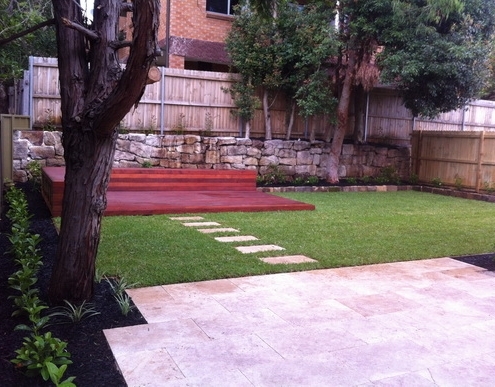 Project Overview – After extensive renovations on this property there was little left of the gardens. 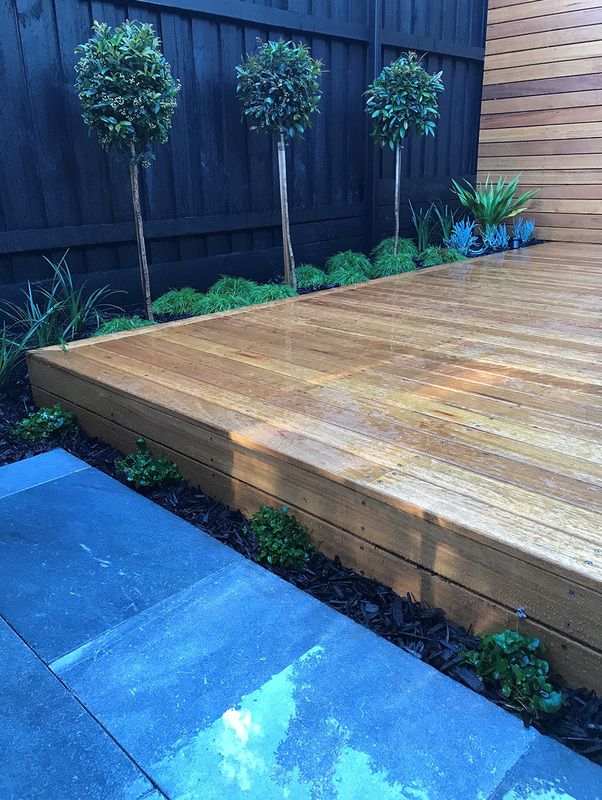 We created modern outdoor entertaining areas using decking and granite paving which seamlessly integrated with the internal spaces. 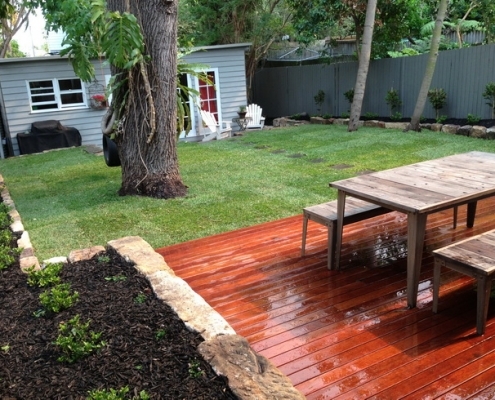 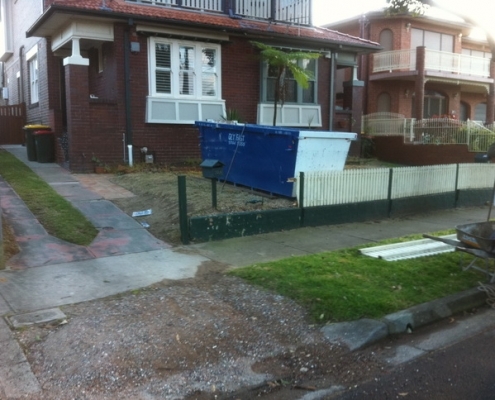 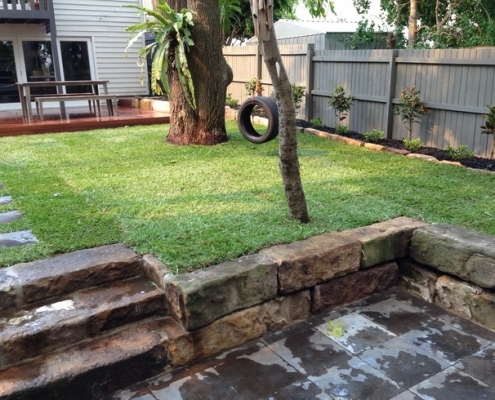 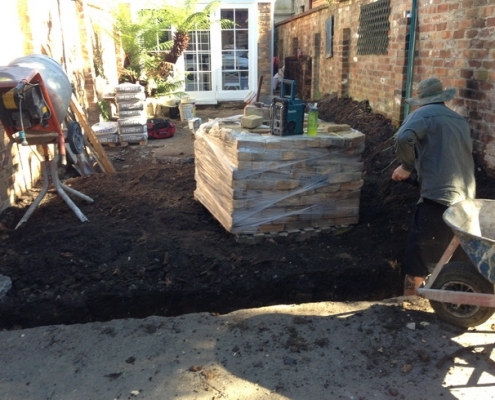 Customer Review – Thanks Excell Landscapes for a fantastic job. 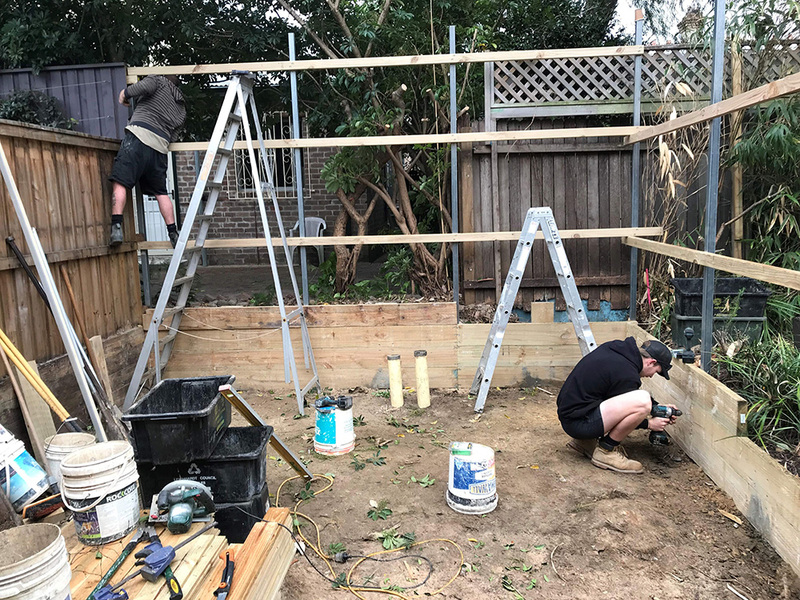 You guys were super efficient and the end result is a modern and functional living area that I am sure our family will enjoy for many years. 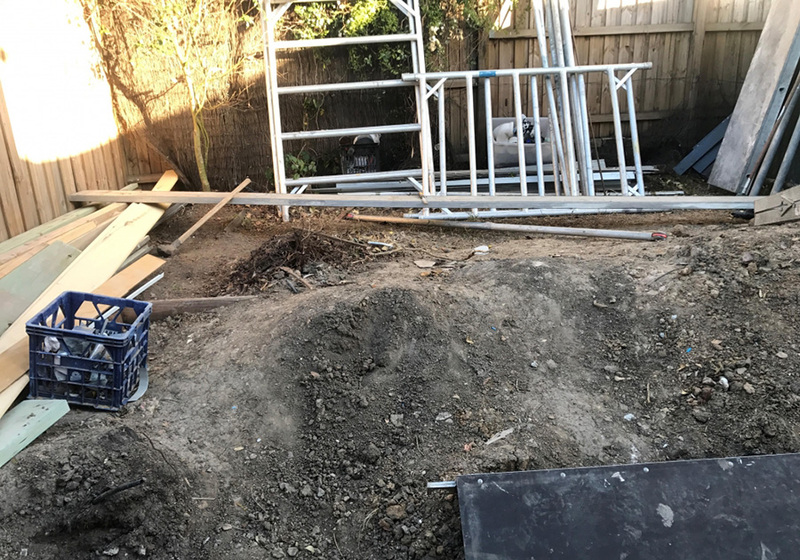 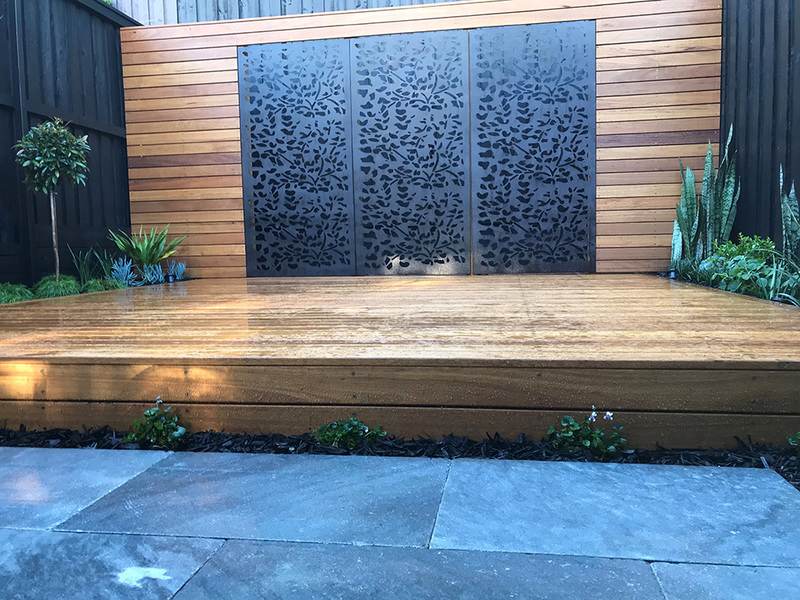 Project Overview – This client came to us with a loose plan to create a contemporary outdoor entertaining area which incorporated a concealed storage area. 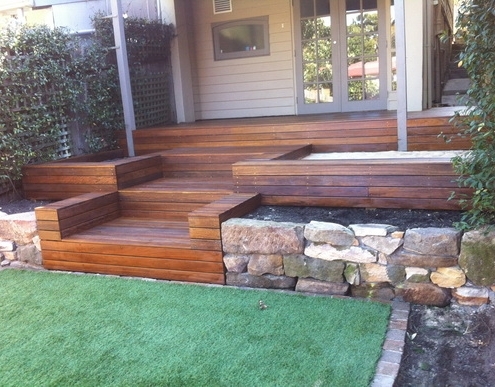 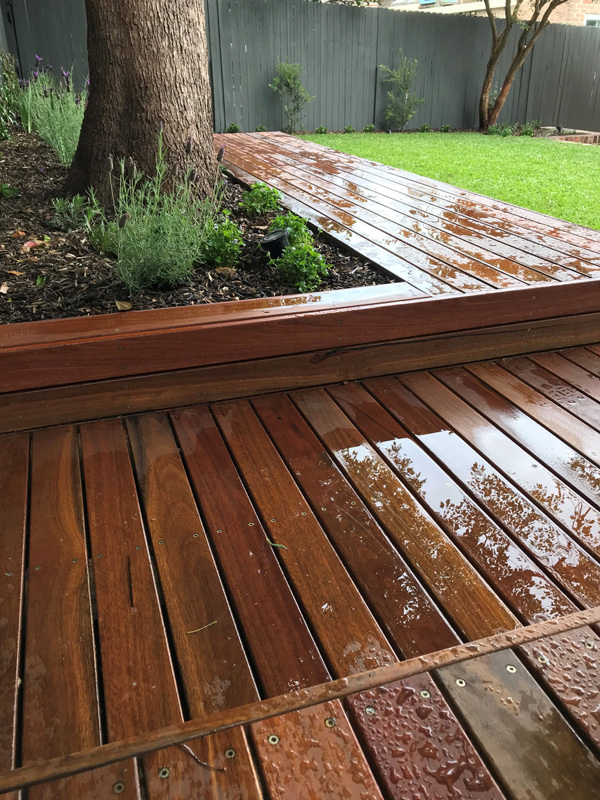 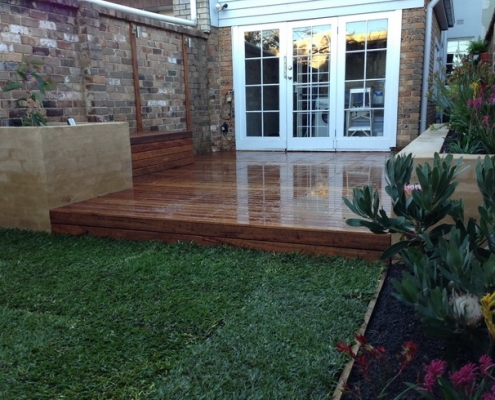 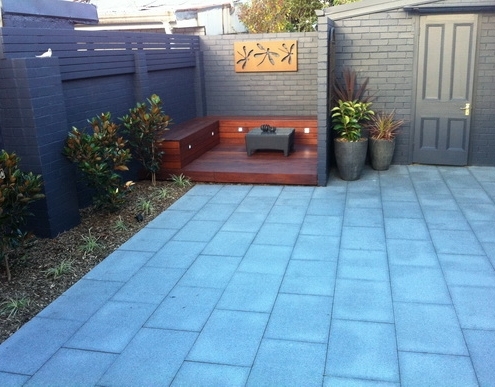 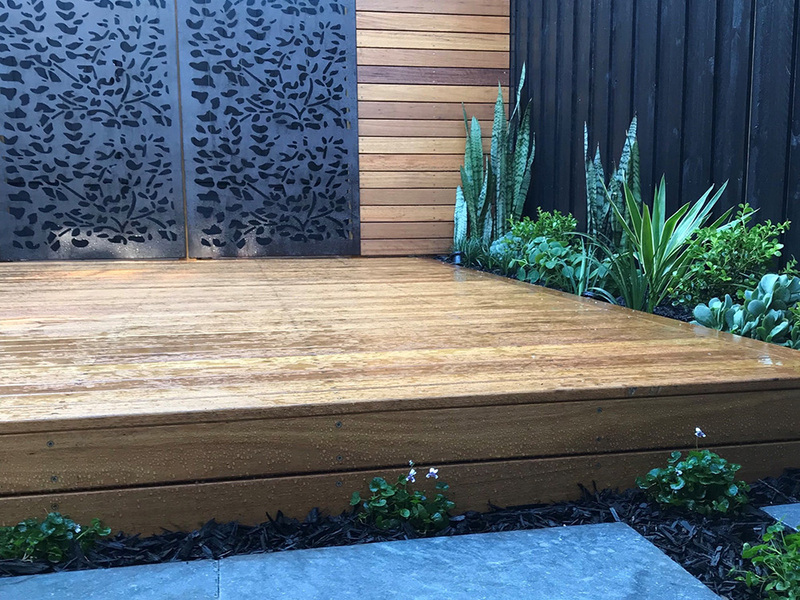 Blackbutt decking, bluestone paving and removable metal screens were used to great effect on this stunning project. 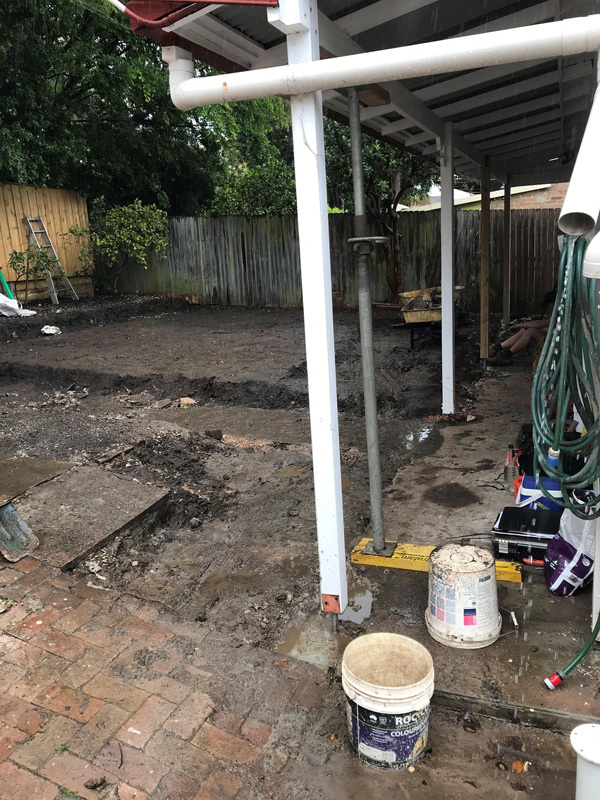 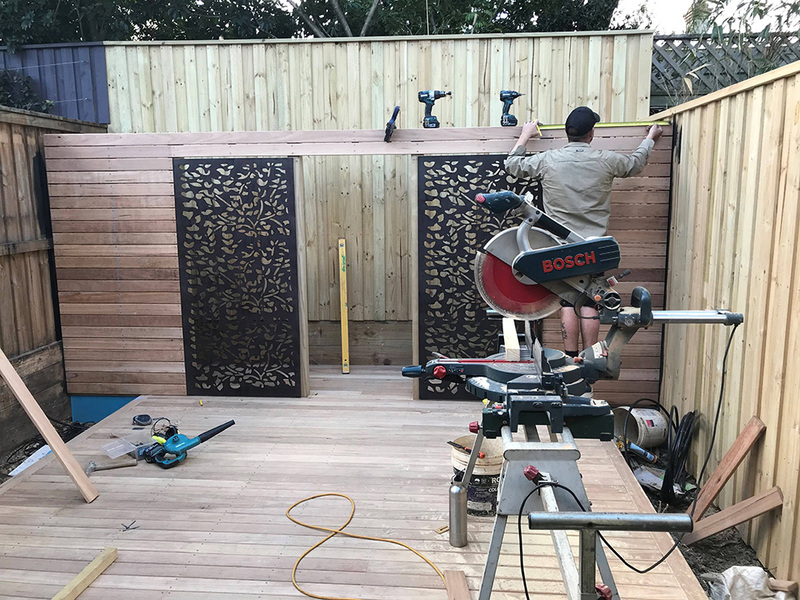 Project Overview – This customer wanted a functional outdoor space installed to compliment their wonderful federation home. 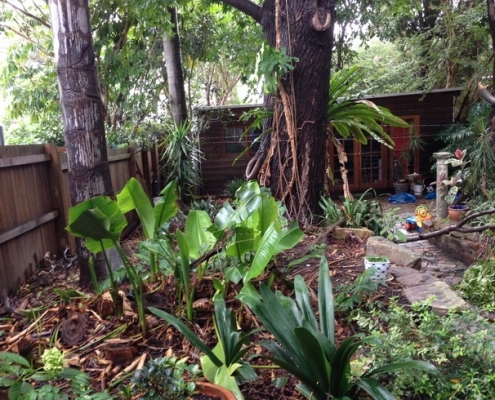 Lush gardens were designed with the aim of creating total privacy and provide shade. 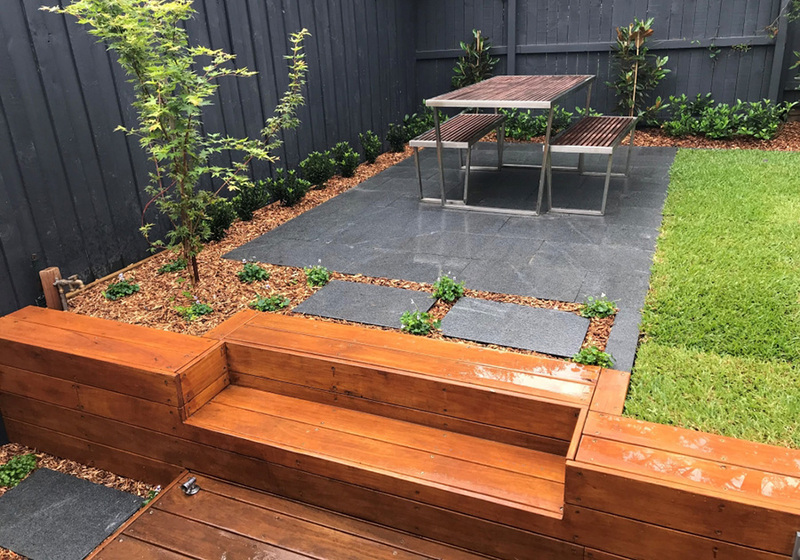 We used Large format bluestone paving to create a sense of space and a parents retreat was constructed to provide a private area for relaxation. 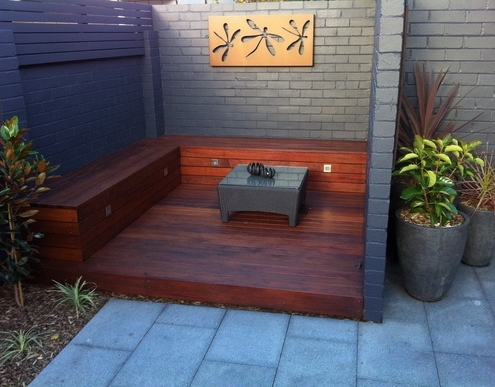 Project Overview – Our client on this project asked us to create a space that had something for the whole family. 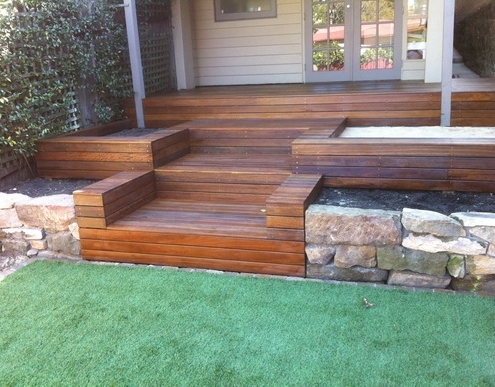 We created a tiered deck which incorporated an entertaining area, kitchen garden and sandpit play area. 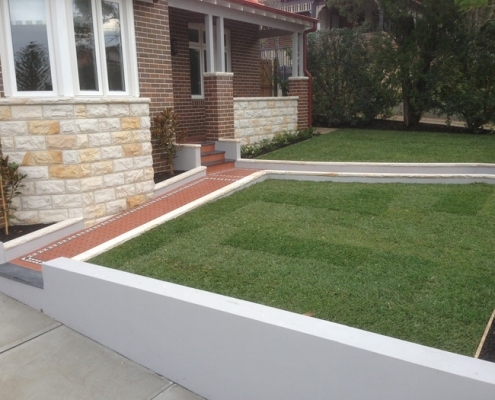 The rest of the garden was levelled to create a large artificial lawn play area. 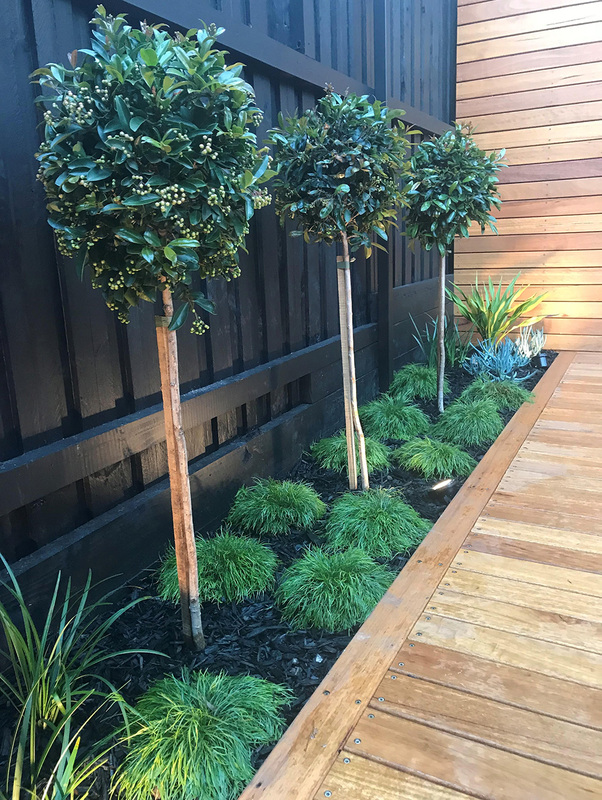 Project Overview – With a contemporary renovation on this Victorian terrace our goal was to create a garden that linked to the inside seamlessly. 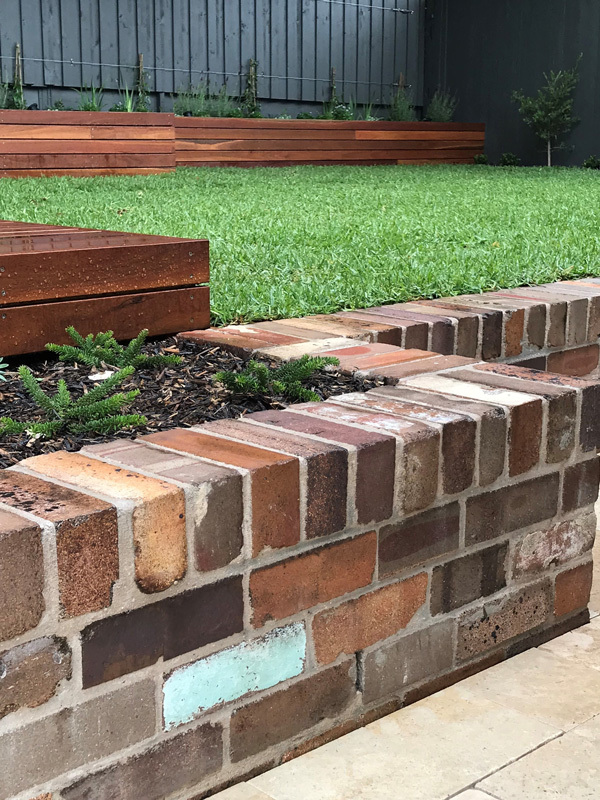 A large deck was constructed with bench seating to extend the internal entertaining area and recycled brick walls were used to create privacy and a sense of character. 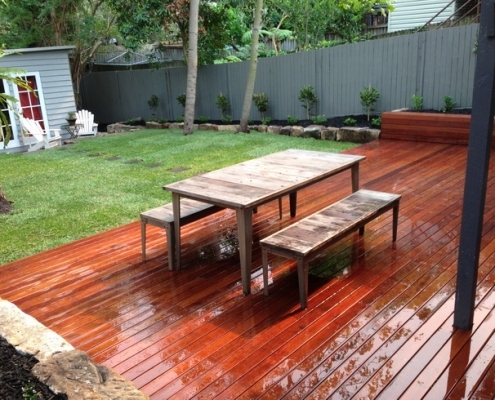 Project Overview – This project was probably one of our biggest challenges to date. 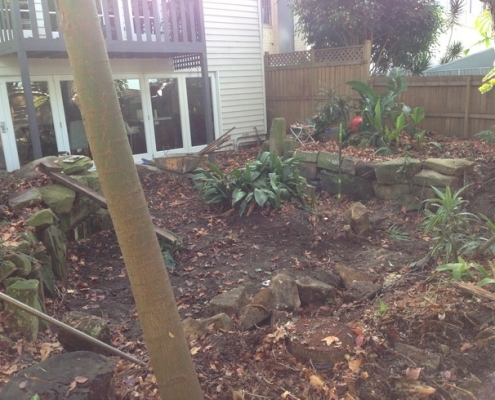 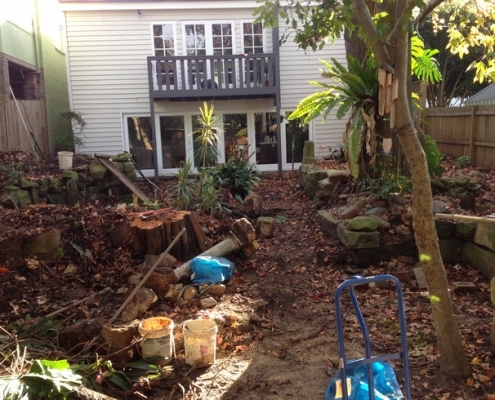 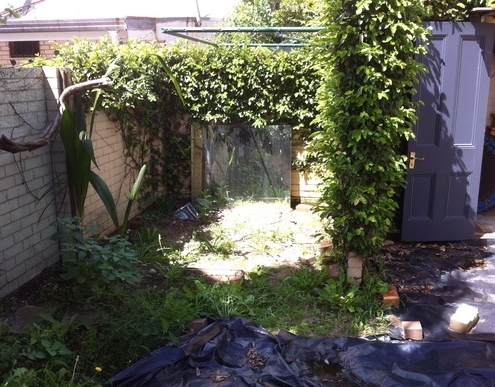 The garden was completely overgrown, sloped significantly and had really poor access. 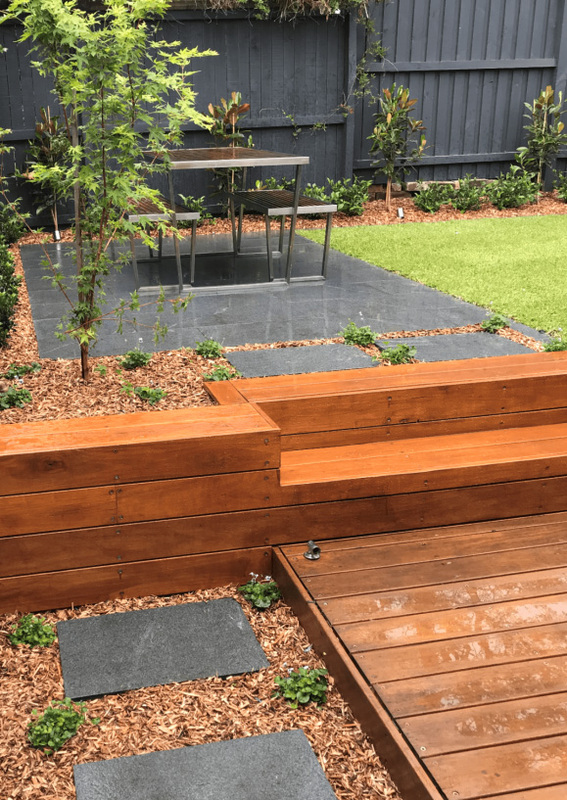 We opted to terrace the garden by creating a large entertaining deck and reuse sandstone blocks that were littered around the site to build retaining walls to facilitate a large level lawn area. 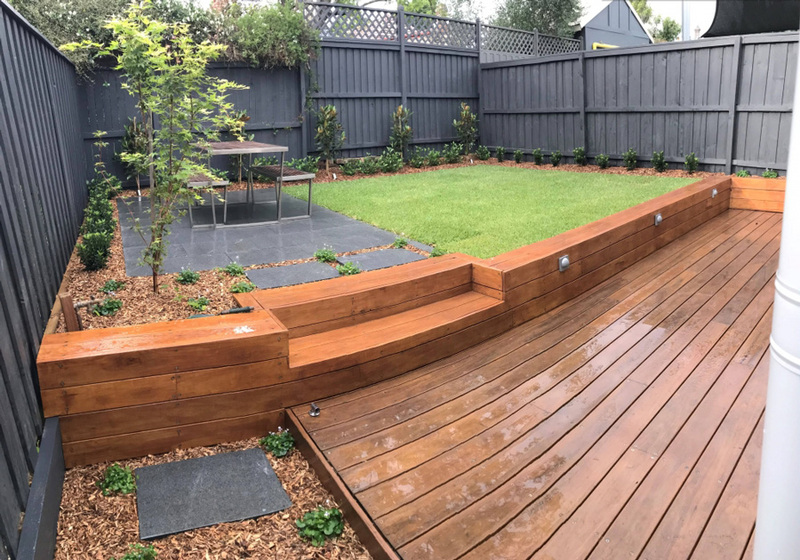 Add to that a vegetable garden, secondary paved entertaining area and magnolias planted along the boundaries and the transformation is complete. 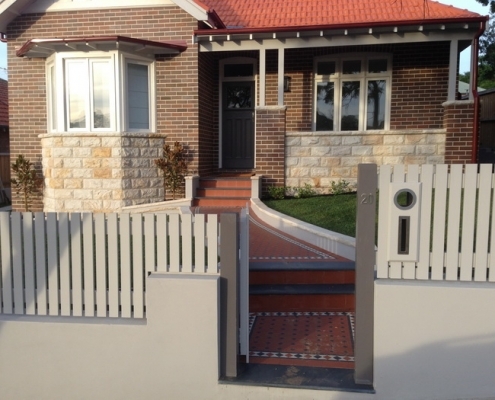 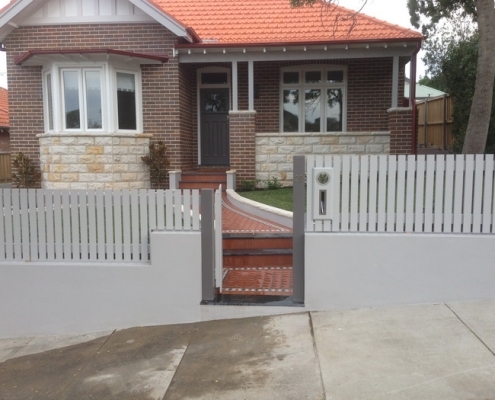 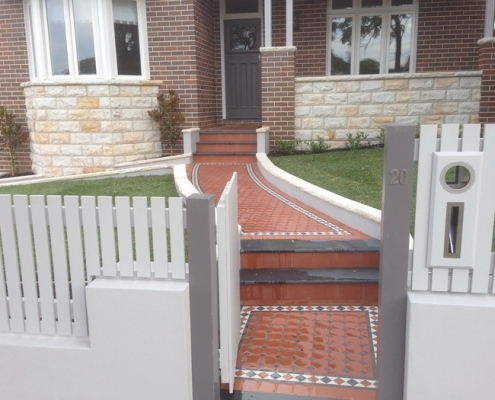 Project Overview – The owners living in this semi detached 1920s house wanted to update the front garden, renew both driveways and construct a new front fence that was in keeping with the existing architecture. 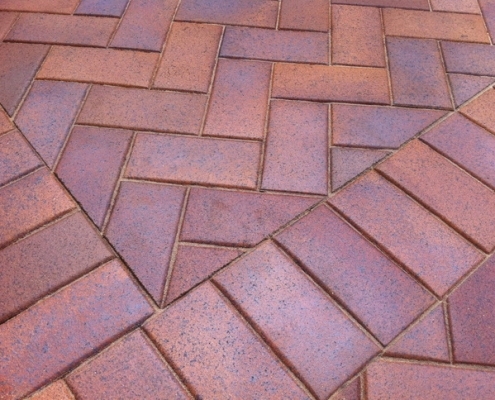 The existing concrete driveways were replaced with a heritage style clay paver laid in a 45 degree herringbone pattern. 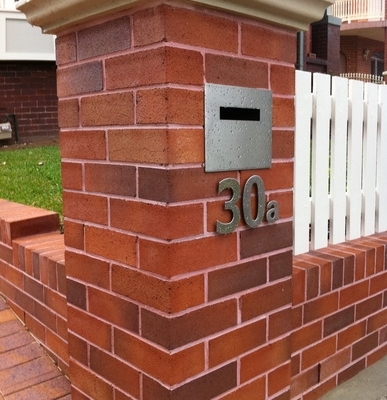 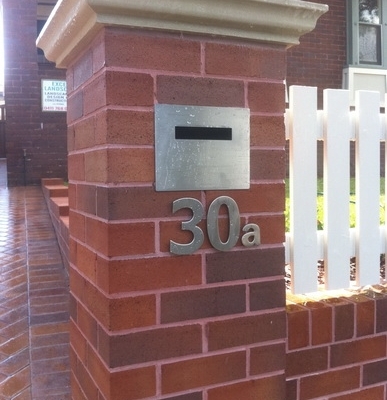 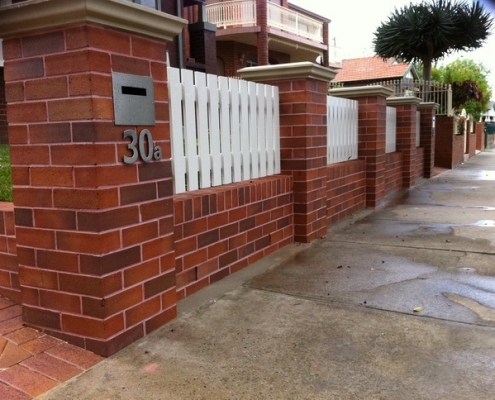 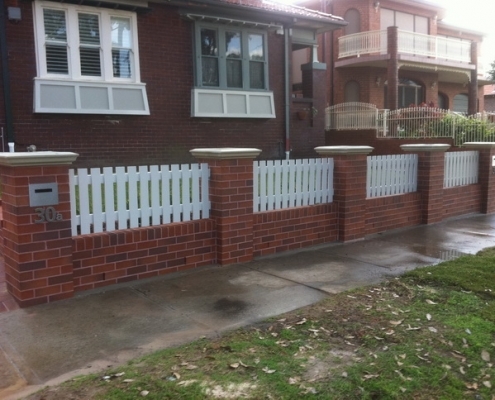 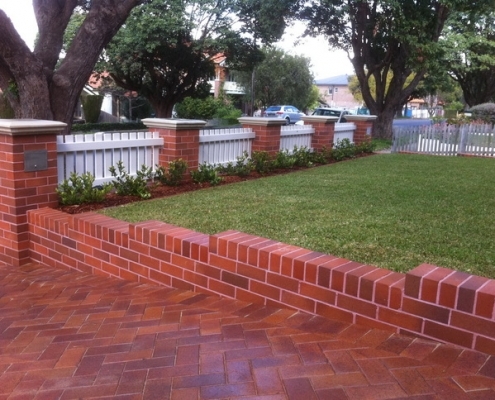 The original house bricks were matched and a stunning front wall was built with sandstone capping and timber in fills. 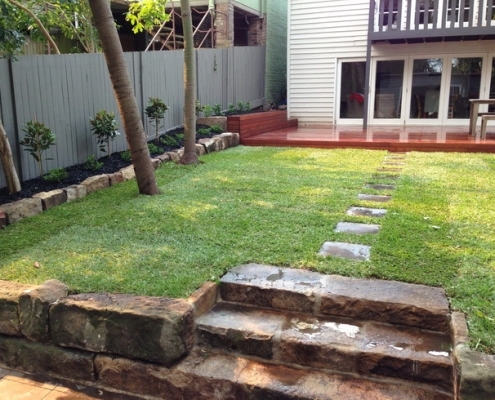 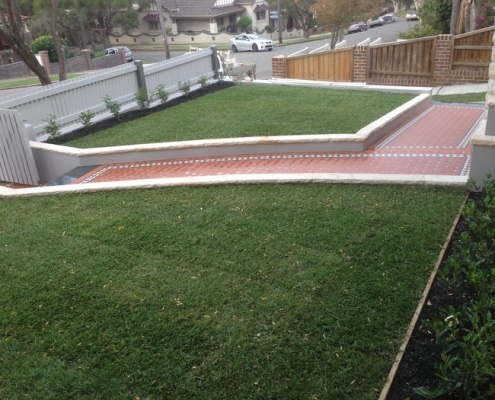 The gardens were finished with a Sir Walter buffalo lawn and low maintenance hedging plants. 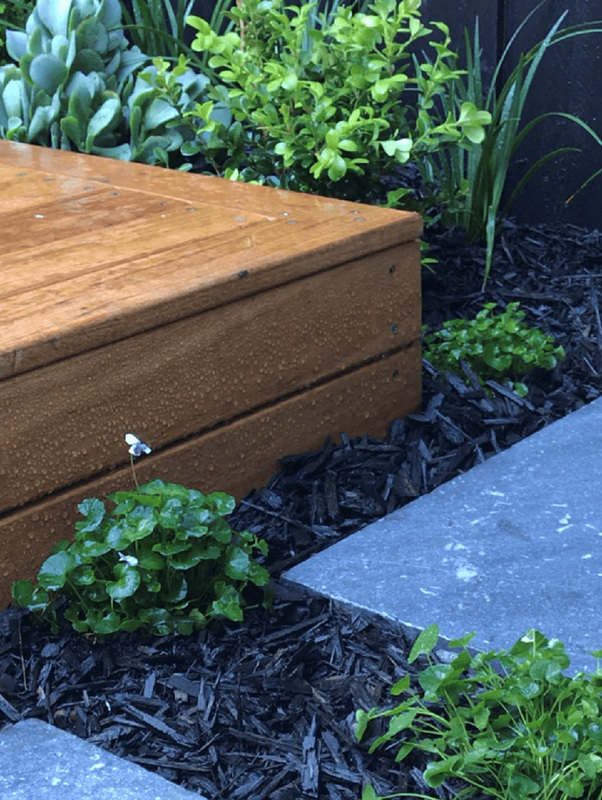 Project Overview – Coming soon. 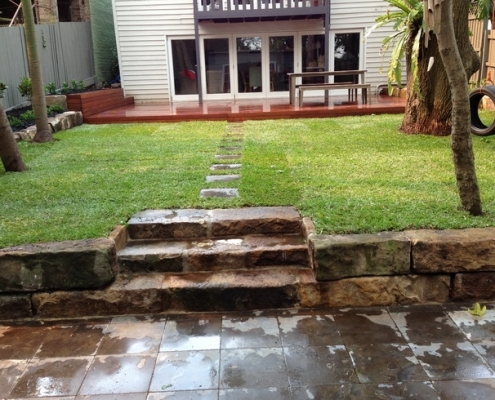 Excell Landscapes is proudly owned and operated by Tim Excell. 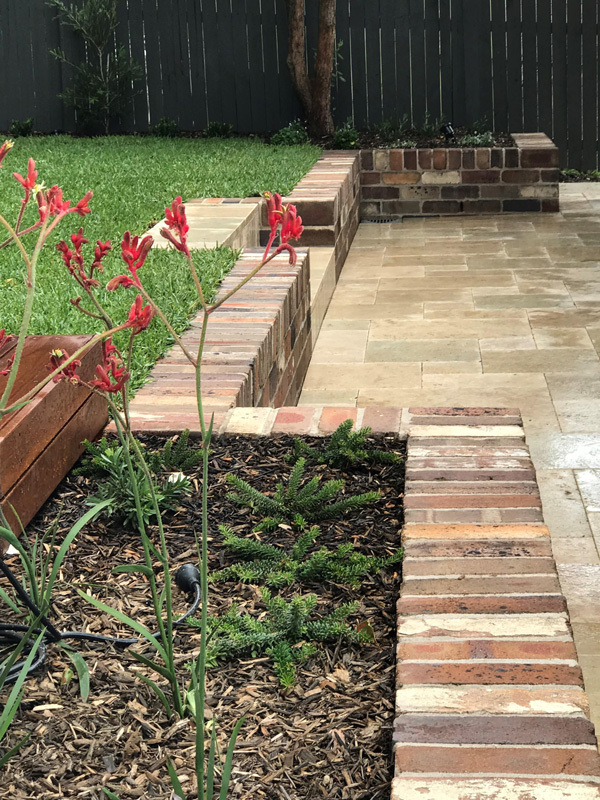 With over 15 years of experience in the landscaping industry, Excell Landscapes has quickly developed into a successful business.